The craziest, most amazing double petunia available! 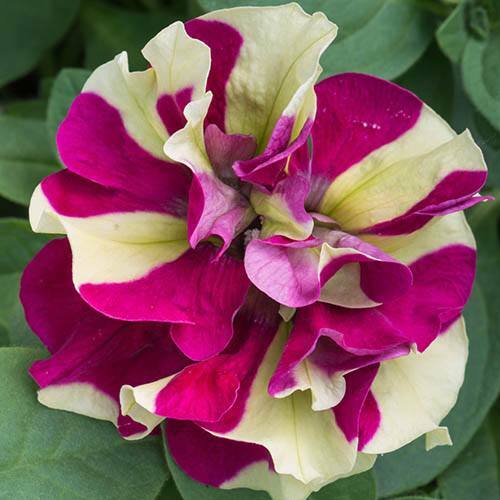 Introducing Petunia Tumbelina Crazy Ripple, the newest and craziest-coloured petunia - an absolute show stopper! Tumbelina Petunias are the original and still the best double, trailing, fragrant petunias, and we're delighted to be able to bring you one of the newest and certainly one of the most unique. 'Crazy Ripple' is an absolute show stopper and will thrill you with its carnation-like flowers, each with masses of gorgeous magenta and lime-green bicolour petals. These layer upon each other in frilly waves, creating a perfect summer patio display - quite unlike any other available. With strong-growing garden performance and extra-large exquisitely ruffled bicolour blooms, plant them in hanging baskets, window boxes and patio containers where they will excel. Their gently trailing habit means they will tidily tumble over the edge of containers and trail for approx. 30cm (1ft), with flowers along the full length of the stems from late May to the first frosts. Really easy to grow, they need only a quick and occasional dead-heading to prolong displays. Your plants will be sent as 6 jumbo plug plants ready to be potted up and grown on before planting out when all risk of frost has passed. Plant into our Easy Fill baskets for the very best hanging basket displays. Unpack plugs immediately, and stand them in water for an hour. If you can’t do this, they can sit in Mini Greenhouses for a week if upright and not too wet. Plugs may be slightly dry or yellow after being in a dark box in the post but they’ll quickly recover. Put them somewhere warm, light and airy such as a windowsill or greenhouse. When potting on, handle plugs carefully. Pot on using our 9cm pots in Shuttle Trays, using good multi-purpose compost. Give your plants a good water initially, then only when the top compost starts to dry. They don’t like to be left in standing water. Dead-head when flowers fade to encourage more flowers.